Posted on September 30, 2015 by Barry V.
Today is predicted to be one of the warmest days of the summer so far, so I get an early start and arrive at Long Pasture Wildlife Sanctuary by 7 am. Conditions are just right as I set up my scope at the end of the Marsh Boardwalk. The tide is low, and there are many birds spread out and feeding on the mudflats in front of me. Most are semi-palmated plovers, but there are several yellowlegs, semi-palmated sandpipers, and a few ruddy turnstones mixed in. I really enjoy drawing birds at the shore! The wide open spaces and unobstructed views are a welcome change to woodland environments, and a spotting scope really comes into its own. Working quietly from one spot, the birds soon forget my presence and some of them approach quite closely. I work with the semi-palmated plovers first. 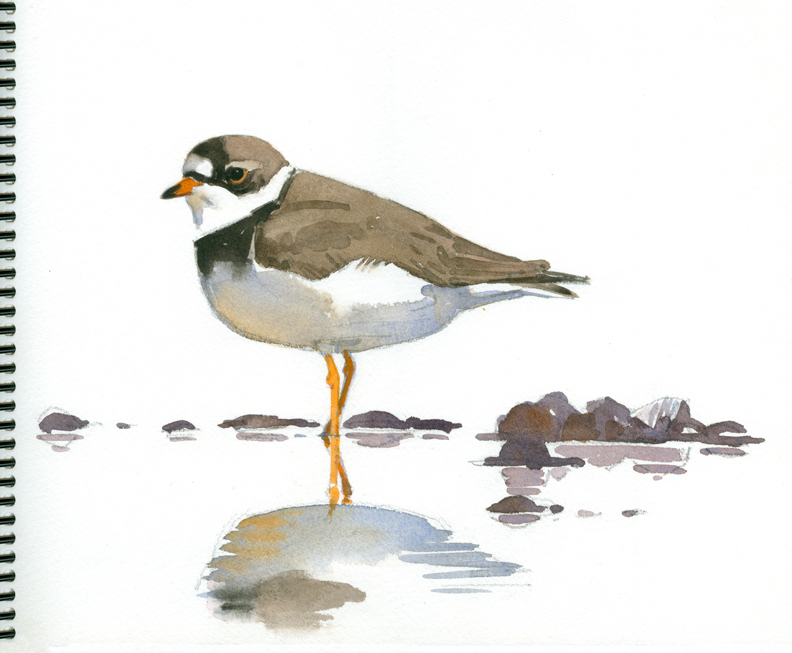 Gigi Hopkins (a guest curator at the Museum of American Bird Art), calls them “semi-sweet plovers” – an apt name! Their gentle expression and compact shape are very appealing. 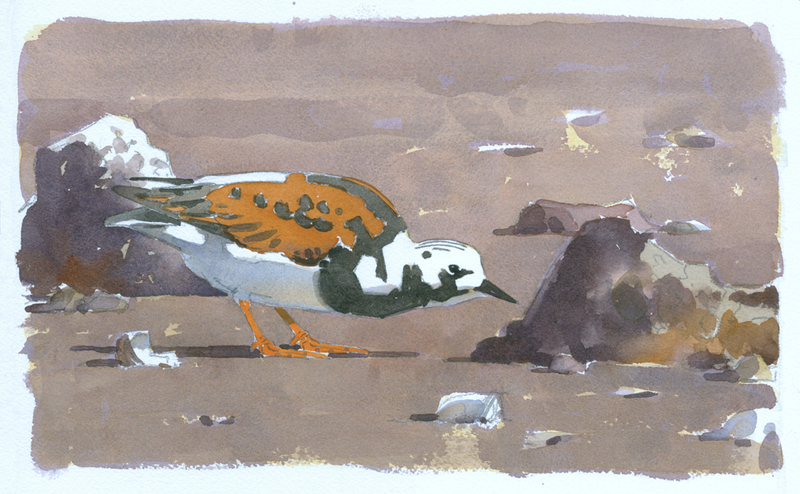 Next, I concentrate on the turnstones. There are larger rocks scattered here and there around the flats, and the turnstones run from rock to rock, picking around the base of the stones. They are quite territorial and if another individual comes too close to their rock, it is summarily warned off. A family group (of people!) arrives, removes their shoes and socks, and heads out on the flats to explore. This puts an end to my drawing as the birds quickly move away, but I’ve had a good session, and am happy to see the kids getting excited over the crabs, snails and worms that they find. Before I leave the flats, however, I focus on a herring gull standing on a section of cribwork installed on the flats by shell fishermen. 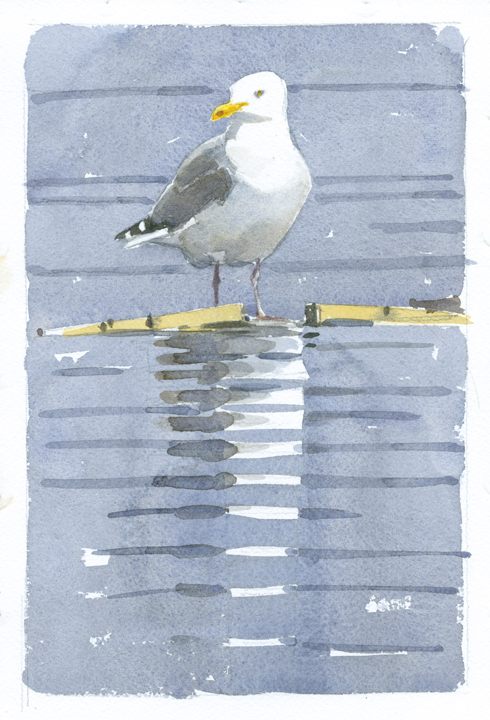 The bird’s gleaming white breast is reflected at intervals on the gentle ripples of the incoming tide, and I do a quick watercolor study. The cribwork is anchored to the bottom, so as the tide floods, the water rises up the bird’s legs, then to its belly, and it finally floats off! Back at the parking area my car’s thermometer reads 96 degrees, so I seek out a shady spot for lunch in the orchard. Ripe fruit is everywhere! 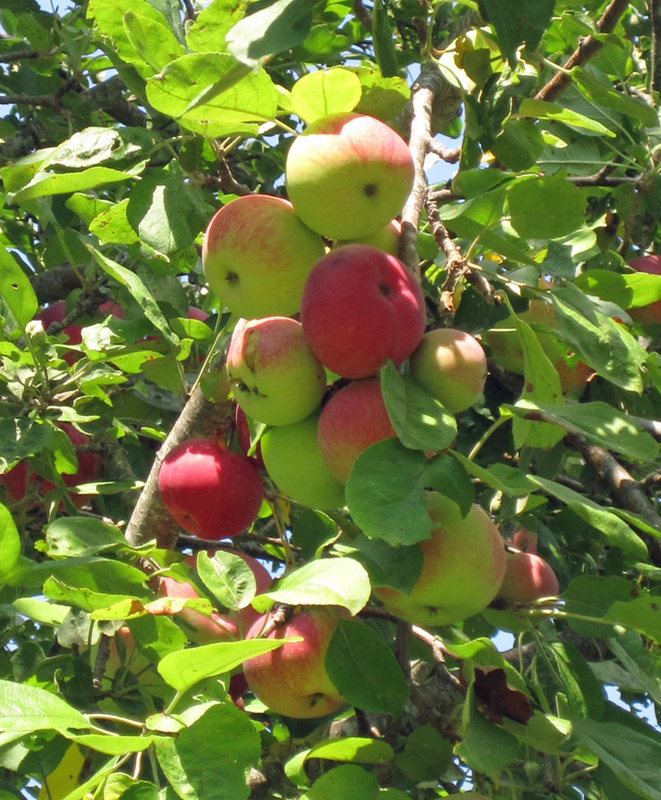 Limbs of the surrounding trees hang low with their burdens of apples, peaches and pears, and the crowns of the wild cherry trees across the meadow are flush with color from the masses of ripe fruit. A hike out along the Holly and Long Pasture Trails is a lesson in tree identification. 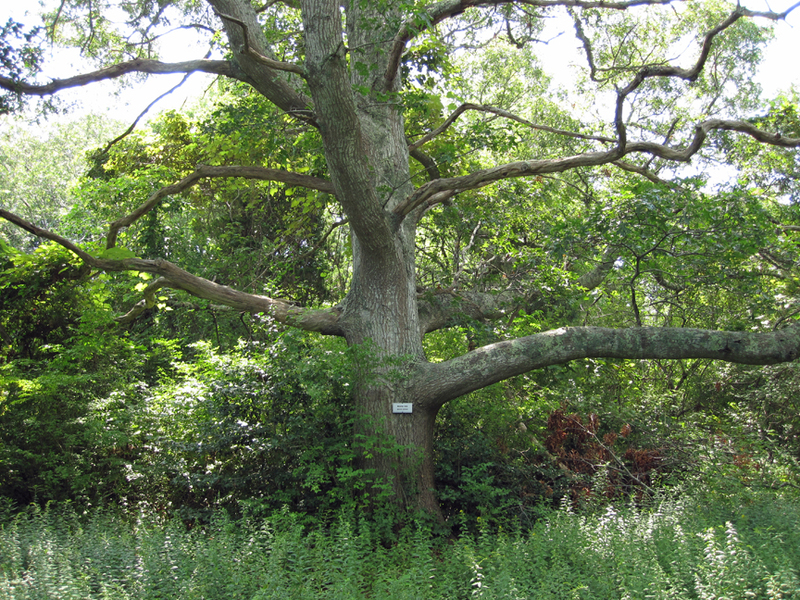 All the familiar New England trees are here (and well labeled), but along with them are big specimens of less common species – mimosa, Chinese chestnut, European larch, white poplar, pignut hickory, black walnut and others. Most of these specimens were planted by the previous owner of the property, Sherman Parker, and they’ve now grown to impressive sizes. 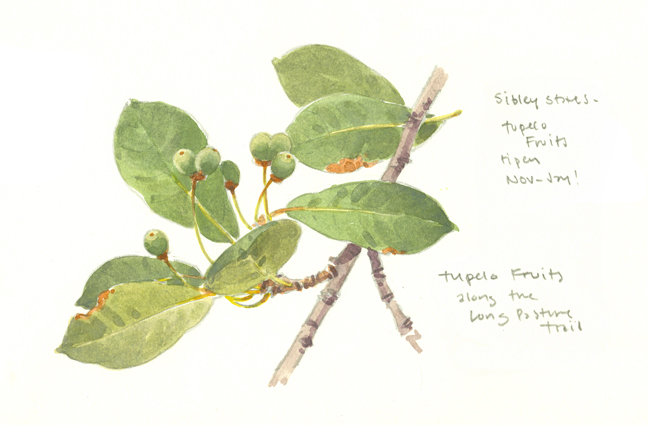 A special delight among the trees is the tupelo (black gum) grove on the Long Pasture Trail. I had read that the dark blue fruits were attractive to birds, but none of them were ripe yet, and I later read in Sibley’s tree guide that the fruits ripen late – from November to January! 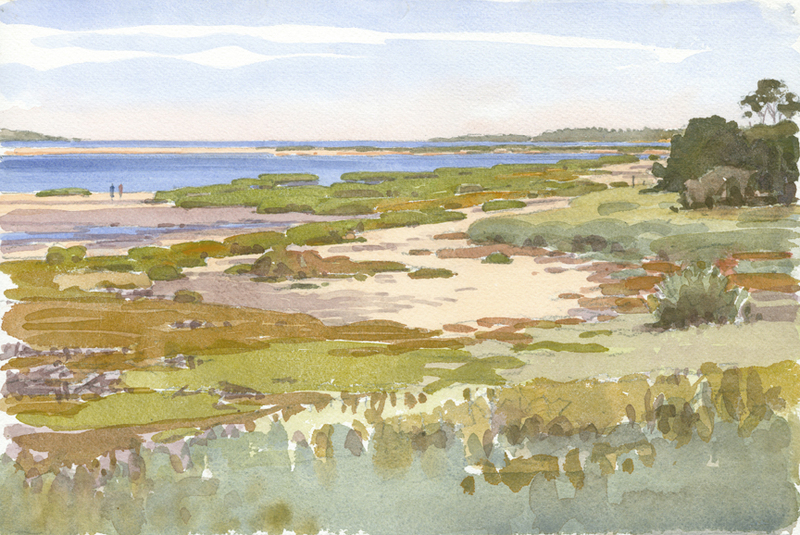 This entry was posted in Artists, Barry Van Dusen Residency, News and tagged Barry Van Dusen, Gigi Hopkins, Herring Gull, Hot, Long pasture, Long pasture wildlife sanctuary, Ruddy turnstone, Semi-palmated plover, Sherman Parker, Sun, Tupelo, Tupelo fruits, Watercolor, Wildlife Sanctuary on September 30, 2015 by Barry V..